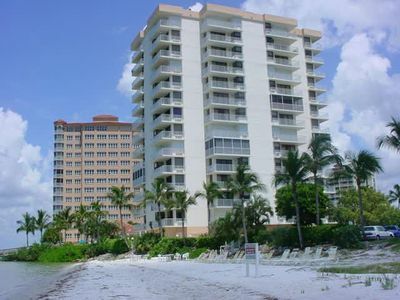 You can walk to the beach in just five minutes when you vacation at Bella Lago 142 in Fort Myers Beach. 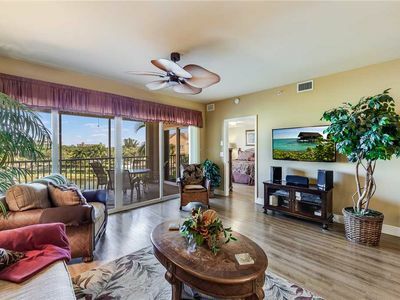 This beautiful condo has a covered lanai with a view of a lagoon and fountain along with gently swaying palms. 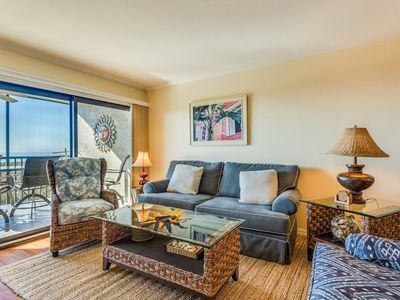 You’ll want to spend lots of time enjoying the salty sea air on this lanai. 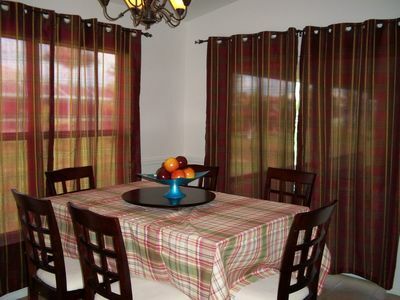 Just gather your group around the table for morning coffee or an evening cocktail. It’s hard to imagine a more peaceful setting. Bella Lago 142 is a two-bedroom, two-bathroom, air-conditioned condo that sleeps up to six when the sleeper sofa is called into service. It’s an ideal getaway for two couples or a small family. From the moment you walk across the threshold of Bella Lago 142, you’ll fall in love. 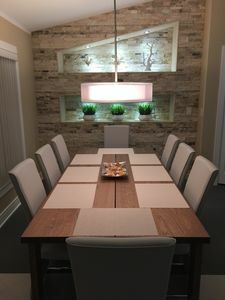 The condo was designed on an open concept that creates a natural flow of conversation whether you’re in the kitchen preparing snacks or talking with your friends in the living room. 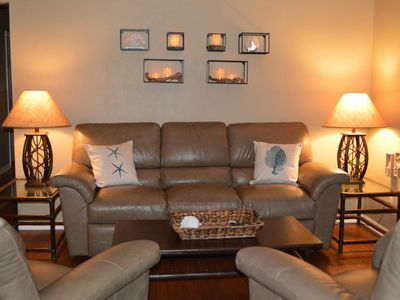 Casual comfort reigns supreme in this inviting condo. The living room is outfitted with a comfortable couch and armchairs all positioned to give a good view of the large flat-screen TV with cable and a DVD player. Perhaps the most striking feature of the living room is the wall of windows looking out on your lanai and the beautiful scene beyond. There is also free Wi-Fi within Bella Lago 142, which is a huge help in checking out restaurant menus online and sharing photos with friends back home. While staying at Bella Lago 142, there's no need to cook if you don’t want to. You can walk over to Santini Marina Plaza where you’ll find a host of restaurants along with interesting shops. This is also a great place to go to arrange a space on a fishing charter. If you’d like to dine in some evening, you have a beautiful kitchen at your command. From stainless steel appliances to spacious countertops and all the cookware and tableware you need, you’ll be delighted with the cooking possibilities within Bella Lago 142. There’s also a community grilling area within your resort in case you’d like to sizzle up some steaks or burgers some evening. 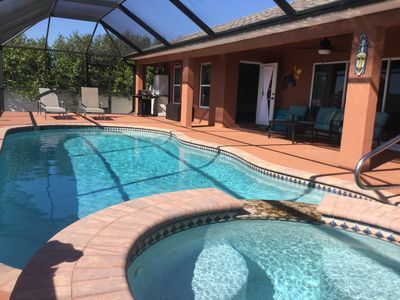 Imagine the fun of a relaxing swim in the resort’s heated swimming pool or soak in the wonderful spa and then sitting down to a delicious steak dinner on your lanai. This is a vacation at its best. If you’re dining within Bella Lago 142 there is a dining room table for six along with a breakfast bar that seats an additional two in case guests drop in. 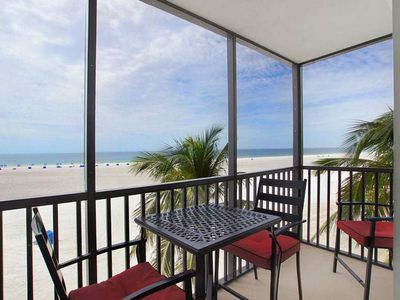 Of course, you can always take your food out to the lanai to dine al fresco. 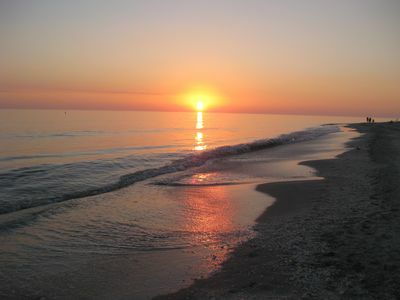 There is so much to see and do in and around your resort and Fort Myers Beach. 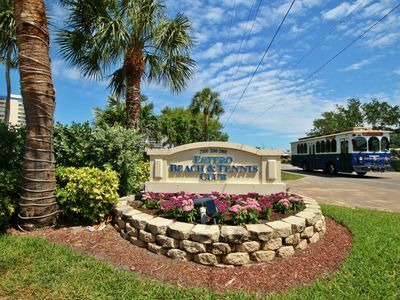 In addition to the pool and spa, your resort also has a fitness center and golf and tennis are close by too. 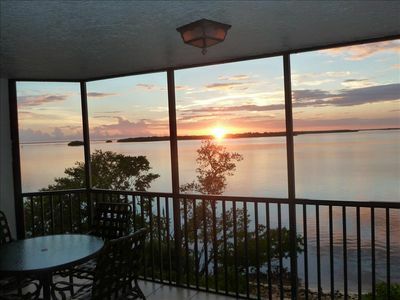 You are just a short drive from Lovers Key State Park. Go there to experience the creatures and vegetation of native Florida. You can bike, hike, canoe, and kayak within this natural paradise. Along the shore, you’ll find some of the best beachcombing available anywhere in Florida. Take a drive north from Bella Lago 142 to reach Times Square with its funky shops and sidewalk cafes. 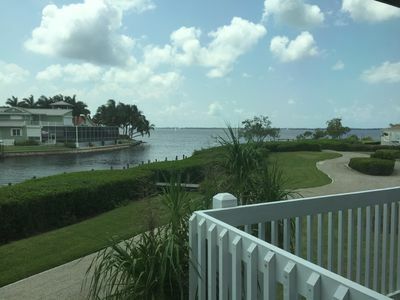 Of course, there’s also jet skiing, fishing, paddle boarding, and dozens of other ways to enjoy the water close to your condo. 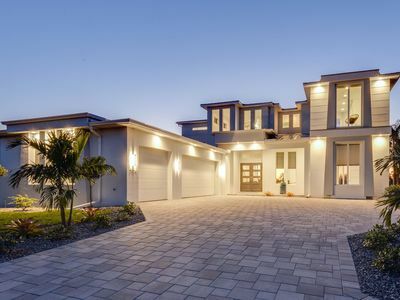 By nightfall, you’ll be ready to take a break and head off to your master bedroom. 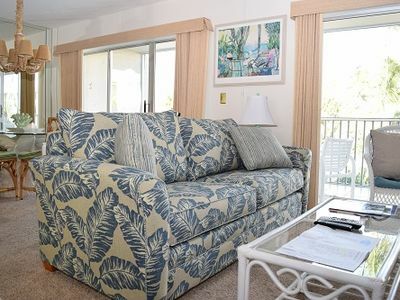 There you’ll find a king-sized bed, dual nightstands with reading lamps, dresser with a TV mounted on top, and large windows with a view of the beautiful resort grounds. There’s also a sliding glass door that leads out onto the lanai where you can enjoy the sounds of nature settling down for a restful night. Just off your master bedroom is your en-suite bathroom with walk-in shower and expansive vanity with dual sinks. Your second bedroom includes two twin beds and a large dresser. There’s plenty of closet space and a ceiling fan to keep the cool air stirring while your guests sleep. Close to the guest bedroom in a bathroom with a shower and tub combination and vanity with plenty of storage space. You’ll also find a washer and dryer within Bella Lago 142 so it’s easy to keep your group in clean clothes. 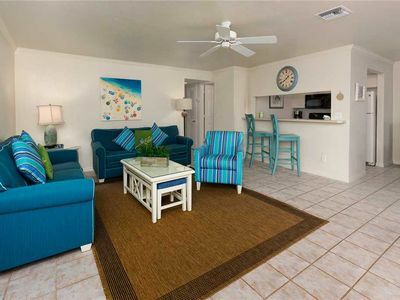 Get away from everyday life and spend your vacation at Bella Lago 142. 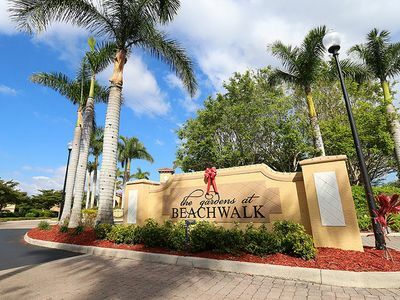 With everything this beautiful condo and resort have to offer it’s no wonder this property is extremely popular. We encourage you to book your preferred dates at Bella Lago 142 as soon as possible. We must be in heaven? 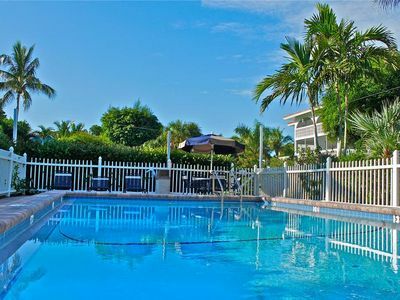 Absentminded...in Captiva Island Village...Short Stroll to Beach and Shopping! 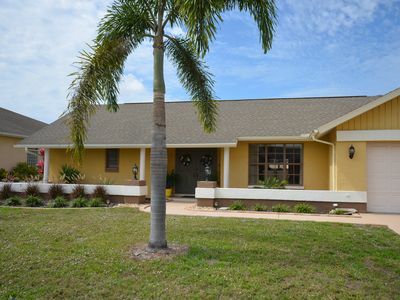 Make memories in this spacious family friendly Florida home!. 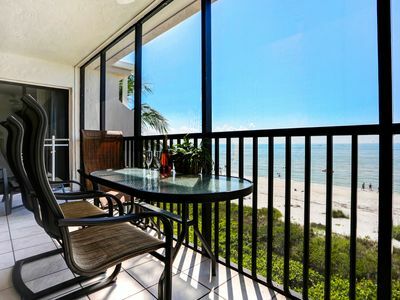 GREAT VIEW OF THE GULF OF MEXICO FROM ISLAND WINDS 4TH FLOOR CONDO! Click for reviews! 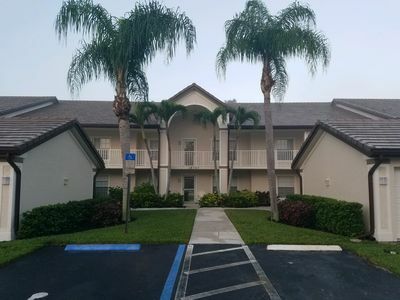 Free WIFI, Central Air, Onsite Parking, Full-sized Washer and Dryer in UNIT!